In the commotion surrounding the immediate real estate plans of LeBron James and, to a lesser extent, a supporting cosmos of NBA stars, it has gone politely unsaid that one of the summer production's principals is—and in fact has been—dead. Dwyane Wade is no longer a great or even very good NBA player, and every measure available to us says he won't be again. 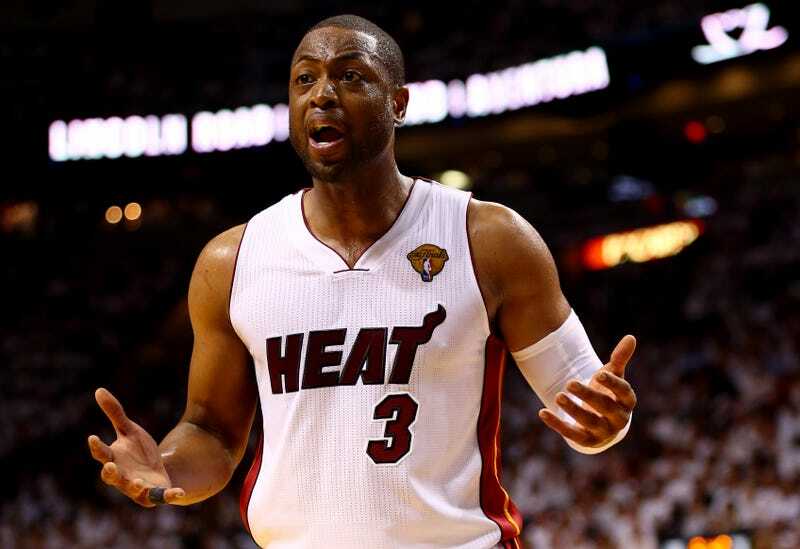 Wade opted out of $42 million in guaranteed money to help keep LeBron in South Beach and add more talent to the Heat. But when LeBron and Riley sit down and look into the future, it may be the case that to pry that margin of error open enough to guarantee more rings Miami needs to get Wade to take even less ($8-9 million). Or, more drastically, say goodbye. Wade has the numbers to back up a max deal, and if LeBron had never come to Miami, we'd probably be talking about Wade much like we talk about Carmelo Anthony. He's only a problem in the context of the Heat's limitations and needs. Talk about "limitations" is a way of saying that despite their reputation among the population at large, there are very few vantages from which last year's Heat looked like a superteam even before San Antonio filleted them. In the regular season, Miami tied for fourth in point differential and was strong in offensive efficiency, but finished outside the top 10 in defensive efficiency. (In the playoffs they registered 108.7, a figure that would have rated 27th in the regular season.) The team shifted down on minutes for all of the core contributors and kept Dwyane on ice for most of the year, playing him just 54 games, but still disintegrated in the Finals. Clearly, they need help. To that end, the Heat's big three opted out of their contracts this summer, in an attempt to give the team some flexibility. But as they're trying to put it back together—or figure out what comes after LeBron—they are likely seeing just how big a problem they have with Dwyane. Wade opted out of a little less than $42 million over the next two seasons. So assuming that he has some sort of agreement with Miami, and that it's honored, any contract that makes it possible to put the band back together with a little help added in while also making Wade whole in some way will be crazy. (For the sake of this exercise, we'll assume that Wade is not going to simply donate money and years.) Non-max deals have the benefit of not being locked into rigid escalations, so we can thumbnail a bit. If he gets an average of the $9 million Ziller suggests over four years, for example, he'd still come out $6 million short of what he opted out of for two years. So, bare minimum, he needs to make $10.5 million per year over four years to break even, or $8.4 million over a five-year deal that pay him until he's 37—and that's if he's just donating years, which seems hopeful. If he's going to be paid the value of those two opted-out-of years plus even a very modest valuation on the last two years of a four-year deal—say, $5 million per season—that bumps those figures to $13 million over four years or $11 million over five (at $3 million for the final season). At those numbers, Wade can't possibly be anything other than a calamity. That's nothing against Wade; he's been one of the best guards in the history of the league, with a career full of thrilling plays that have taken a toll. This is a look at just how high a cost that kind of brilliance has had on similar players. Using Basketball Reference's Play Index, we narrowed down a group of comparable players—guards 6-foot-5 and under who by the age of 32 had played in at least 500 games while averaging at least five free throw attempts per game and a usage percent of at least 20. We're using these as proxies for the amount of physical punishment a player can and does take (free throws are indicative of both being athletic enough to get to the rim and the amount of times you've been hit) and workload (usage percent is the percentage of your team's plays you use; Wade has had some the highest usage seasons ever). It turns out that this is a quite specific type of player. Of the 16 players who fit these criteria, five are current Hall of Famers, with Wade, Iverson, and Paul essentially locks, and all were All-Stars. As a whole, through age 32 (though not everyone made it that far), they averaged 20.4 points, 6.2 assists, and 4 rebounds per game on 46 percent shooting. It gets ugly in a hurry after that. Shooting guards in general are not great late-career bets, but this group, in particular, aged disastrously. Excluding Chris Paul and Wade, only seven of 14 even played a game when they were 33, going 11.8, 3.5, and 2.7 in an average of 27 minutes in 46 games. For reference, in the age 32 season, which nine players played—Kevin Johnson and Sidney Moncrief both missed an entire season at 32 but returned to play the following year—this group averaged 18.8 points, 5.2 assists, and 3.4 rebounds, and played 34 minutes in 61.2 games. Wade averaged 19, 4.7, and 4.5 in 32.9 minutes and 54 games last year in his age-32 season, so it's not like he's shaping up to be a big outlier. At 34, the dip continues. Two more players drop out, and the five that survive average 10.5, 3, and 2.2, playing 23.4 minutes in 49.5 games. That doesn't exactly sound like a player you'd be anxious to pay $13 million per year. The Wade-comp group played in an average of 120.8 games after the age of 32. When we expanded our parameters to include guards who were taller and who took fewer free throws (min. 3.5 per game through age 32) and kept usage percent pinned at 20, that number jumped to 183.5. That's a difference of 62.7 games—almost a full season, or more if you're on Wade's 54-game plan—tacked onto the life of a high-usage guard just by virtue of being taller and taking fewer free throws. All that said, it's not like Wade will necessarily shrivel up and die (more so than he already has) this coming season, or in the next few. He's already added that at times dreadful post game; according to Synergy Sports, he went low 14 percent of the time last season (compared to just 2 percent in 2007-08) and was sharp enough to rank in the 92nd percentile in the league in post-up efficiency. That post-up efficiency dropped by more than half in the playoffs, when he couldn't play rested every day, but it's at least something to build on. Kevin Pelton's WARP projection, based on his SCHOENE system, has a reasonably optimistic outlooks on Wade—though when Pelton adjusted for the minutes Wade played this year, the numbers deflated a bit. And just doing a cocktail-napkin, baseball-style projection, weighting the most recent season three times, the second-most twice, and the third-most once, Wade would project to 6.7 Win Shares next year, 6.2 the year after, and 5.7 and 5.2 the years after. Using the system we used to calculate LeBron's actual on-court worth, that would put Wade at $11.6, $10.7, $9.9, and $9 million per year—a total of $41.1 million over four years, or, remarkably, just about what Wade opted out of for the next two. These numbers are artifacts of an unquestionable reality: Wade has been an orbital contributor, and not the team's fulcrum, for some time now, and any attempt to make him more than that just increases the risk he drops clean off the Earth, like the other players he most resembles did. If he isn't quite thought of in those terms, it's because there's an arc to these things, and Wade's reputation as an aloof shithead has a lot to do with being the diminished, humbled hero who has never actually been humbled. It's a lot easier to root for the guy throwing up every piece of junk he has left when he isn't walking around like he's still putting in 30 a night. Wade can likely exist more or less comfortably in some complementary role, at least for a little while, which would work out just fine if he were in line to be paid as such. But his (implied) salary, like his broken body, is an artifact of the player he was. Whether or not he finally has to give that up depends entirely on what happens with LeBron, but what happens with LeBron will almost surely be affected in some large part by how ready Wade is to be paid more like a sixth man than a star. 1Nominally a shooting guard, Wade has existed as a de facto point guard for much of his career, and has racked up assist totals in line with that role and his usage—plenty of onlookers thought it might be Wade and not LeBron who initiated the offense when the Heat came together. But the players who have bucked this trend are the very, very best playmakers, like Magic, Stockton, or even Andre Miller.